GW 인스텍은 엔트리 레벨의 새로운 디지털 오실로스코프 GDS-1000B 시리즈를 출시합니다. 합리적인 가격과 다양한 기능을 갖춘 GDS-1000B 시리즈는 교육 분야와 기초 산업 분야에서 유용하게 사용될 수 있습니다. GDS-1000B 시리즈 디지털 오실로스코프는 70MHz/100MHz 대역폭을 갖는 2/4채널의 모델 라인을 제공합니다. 채널당 최대 1GSa/s 샘플링 속도와 10Mpts 레코드 길이를 지원합니다. 파형 변화를 자세히 관찰할 수 있도록 50,000wfm/s의 파형 업데이트 속도를 지원합니다. 7인치 WVGA 컬러 LCD와 256 색상 그라데이션 표시 기능을 제공합니다. 각종 조정 노브에 Zero 키 기능을 추가하여 사용자는 보다 효율적으로 장비를 사용할 수 있습니다. 파형 분석 모드에서 1Mpts FFT 신호 표시를 통해 더욱 섬세한 주파수 영역 신호 분석이 가능합니다. 그밖에 다양한 트리거 기능, XY 모드 분석 및 Go/NoGo 기능 등을 지원합니다. 또한 PC에 의해 원격으로 파형 데이터와 스크린 샷을 저장할 수 있는 OpenWave 소프트웨어를 제공합니다. GDS-1000B 시리즈는 50,000wfms/s의 파형 업데이트 속도를 갖추고 있어 파도 신호 파형이나 지터 신호들을 경쟁 모델에 비해 쉽게 관측할 수 있습니다. VPO 신호 처리 기술과 멀티 레이어 그레이 디스플레이가 결합하여 사용자는 쉽고 완벽하게 갑작스런 유입 신호와 파도 파형을 관찰할 수 있어 파형 디버깅 효율을 향상시킬 수 있습니다. 아래 그림과 같은 주파수 변조 신호의 주파수 변화를 쉽게 관찰할 수 있습니다. 기존의 디지털 스토리지 오실로스코프와 비교하여 GDS-1000B 시리즈는 좀더 명확하고 유용한 정보를 화면에 표시합니다. GDS-1000B 시리즈는 아날로그 오실로스코프의 화면 처럼 심오한 계조 변동을 묘사할 수 있도록 256 색상 그라디언트 표시 능력을 갖추고 있습니다. 아래 그림과 같이 멀티-레이어 비디오 신호가 입력되면 GDS-1000B는 정밀하게 컬러 버스트 신호를 표시하고 밝기로 레이어의 정보를 보여줍니다. GDS-1000B 시리즈 오실로스코프는 데이터 검색을 위해 강력하고 비교할 수 없는 10M 포인트 레코드 길이를 제공합니다. 채널당 10M 포인트 레코드 길이는 동급 최강의 사양입니다. 10M 포인트 레코드 길이를 통해 사용자는 기본적인 측정 기능을 수행하는 동안 쉽게 파형의 세부 사항을 포착할 수 있습니다. 연속적인 긴 사인파가 입력되고 타임 스케일이 1ms/div로 설정되면 레코드 길이가 짧은 오실로스코프는 파형을 확대할 때 외곡된 파형을 표시합니다. 반면에 GDS-1000B 시리즈는 파형을 20ns/div로 확대해도 정확한 사인파를 보여줍니다. GDS-1000B의 FFT(Fast Fourier Transform) 기능은 최대 1M 포인트의 디스플레이를 제공합니다. 기존의 디지털 오실로스코프는 일반적으로 FFT 모드에서 오직 1000 포인트 길이만을 지원하여 주파수 영역 모드에서 스펙트럼 강도 분포를 정확히 보여주지 못합니다. GDS-1000B 시리즈 오실로스코프는 1M 포인트 FFT 디스플레이를 제공하여 각 스펨트럼의 세부사항을 명확하게 표시할 수 있습니다. 또한 50,000wfms/s 파형 업데이트 레이트와 결합하여 FFT 분석 모드는 실시간 스펙트럼 분석기처럼 빠르고 정확하게 주파수 영역을 측정할 수 있습니다. 아래 그림은 40kHz 변조 신호와 5kHz 주파수 편이를 갖는 표준 FM 신호로 변조된 200kHz 반송파를 보여줍니다. GDS-1000B 시리즈는 1M 포인트 FFT 메모리를 장착하였기 때문에 5kHz 주파수 편이 간격을 정확하게 화면에 표시할 수 있습니다. GDS-1000B 시리즈는 파형의 세부 사항을 관찰할 수 있도록 부분 파형 줌-인 기능을 제공합니다. 화면이 두 개의 창으로 나눠지고 상단 창에 전체 파형과 확대 마크가 표시되고 하단 창에 확대된 부분 파형이 표시됩니다. 또한 GDS-1000B 시리즈는 줌 모드에서 재생/일시정지 기능을 제공하여 전체 파형을 쉽게 관찰할 수 있습니다. GDS-1000B 시리즈 오실로스코프는 Edge, Delay, Pulse 및 Vide 트리거 등을 포함하는 다양한 종류의 트리거 기능을 제공합니다. The GDS-1000B series oscilloscope provides the educational market with some powerful measurement functions. Among them, the X-Y mode display is an excellent example. Teachers and students can use X-Y mode display to conduct Lissajou diagram teaching, which allows users to easily understand the relation between waveforms and frequency while measuring sine waveforms with different frequency by dual channels. For engineers working for the industries, the X-Y mode display can be used to conduct yield rate tests for basic components’ electric conduction and non conduction. 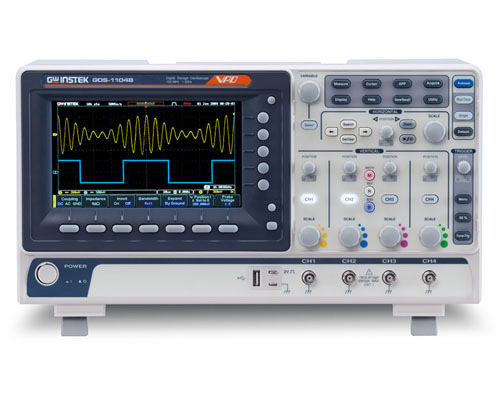 Therefore, the X-Y mode display plays an important role in basic oscilloscopes. For the industries, the yield rate determination is very important to mass production. The GDS-1000B series oscilloscope provides the Go/NoGo analysis function to accelerate the yield rate analysis. From the right diagram, the Go/NoGo function provides a standard waveform template for examining DUT’s waveforms. The function can freely adjust the size of template. A defect message will be shown if the DUT’s waveform is abnormal and touches the template. The function is not only very useful measurement tool for production lines but also a very convenient tool for engineers to observe waveforms in a long period of time. For electric circuit measurement and debugging, R&D engineers require oscilloscopes as well as basic voltage meters. The GDS-1000B series oscilloscope equips with a digital voltage meter with three-digit voltage value and five-digit frequency value. Engineers, by pressing the option key, can select the digital voltage meter function from the menu to measure DC/AC voltage, duty cycle, and frequency. Engineers can not only measure waveforms but also monitor the electric parameters of each component on the circuit board. The function is a very convenient tool. The GDS-1000B series oscilloscope has the data log function option, which allows users to observe and record waveform changes in a long period of time to ensure product’s reliability and stability. The data log function can set data storage time and interval based on the test requirements. Record time can be set from 5 minutes to 100 hours and the interval can be set as 5 seconds the shortest. Data log formats include waveform and point data in CSV file. Data can be saved to USB, GDS-1000B or remote computer via LAN. It is very user-friendly and also an advanced measurement management tool. 엔지니어들은 전기 회로의 신호를 테스트하며 종종 잡음 문제로 어려움을 겪습니다. GDS-1000B 시리즈는 HPF 또는 LPF를 설정할 수 있는 디지털 필터 기능을 지원합니다. 사용자는 각 채널에 대해 독립적으로 필터 주파수 변수를 설정할 수 있습니다. Tracking on 기능은 모든 채널에 같은 필터 주파수를 설정합니다. GDS-1000B 시리즈의 디지털 필터 기능으로 사용자는 잡음 간섭에 대한 영향을 크게 줄일 수 있습니다. The GDS-1000B series oscilloscope is equipped with 36 different automatic measurement parameter functions. Users, after obtaining measured waveforms, can select different measurement parameters from Measure key according to different measurement requirements. The GDS-1000B series shows simultaneously eight sets of different measurement parameters on the bottom of the display screen. Users can also select to show all parameters if the preset eight sets are insufficient. Once the selection is made, all 36 measurement parameters will be shown on the center of the display screen. This is a very convenient measurement tool for students writing dissertations or engineers writing reports. The GDS-1000B series oscilloscope, via the OpenWave connection software developed by GW Instek, can connect with the PC. Users, after installing USB driver under Windows interface, can connect GDS-1000B with the PC through USB cable and OpenWave software. Waveform interpretation and retrieval can be done from the PC end. Data retrieval and storage can better facilitate users in processing analysis. OpenWave connection software is indeed a very powerful tool for engineers to compile reports or to integrate systems.